HERE ARE PHOTOS of the Missouri River, taken near Hermann, Missouri, on Christmas night. The Missouri is one of the world's great rivers, known for its beauty, danger, and practical use. This is not a prizewinning photo, but it shows somewhat the view of the river at night. This is looking northwest, from atop a bluff, about 200 feet above the river. The red light is a navigation marker, indicating the downstream left bank of the river. 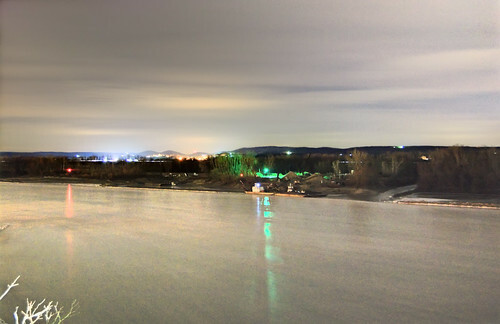 A gravel pit, illumined by the green light, is in the center and a tugboat is docked by it. To the right, you can see the mouth of the Loutre River (loutre = French for 'otter'), which marks the boundary line between Montgomery and Warren Counties. Looking west up the river, you can see an accumulation of ice between the wing dams in the stream. In the background is the new Highway 19 bridge, as well as the Gasconade County courthouse. 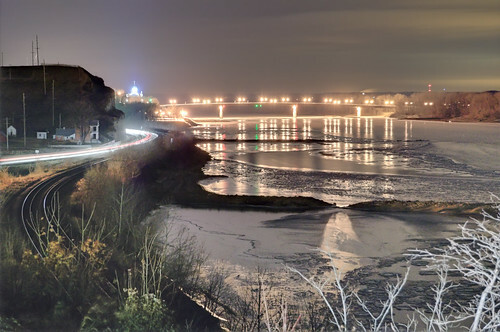 To the left is Kollmeyer's Bluff, a railroad track, and Highway 100, illuminated by moving car lights. Please have pity on your poor servant-photographer, who risked life and limb in the cold night on the edge of a hazardous cliff, while taking these photos for your enjoyment!